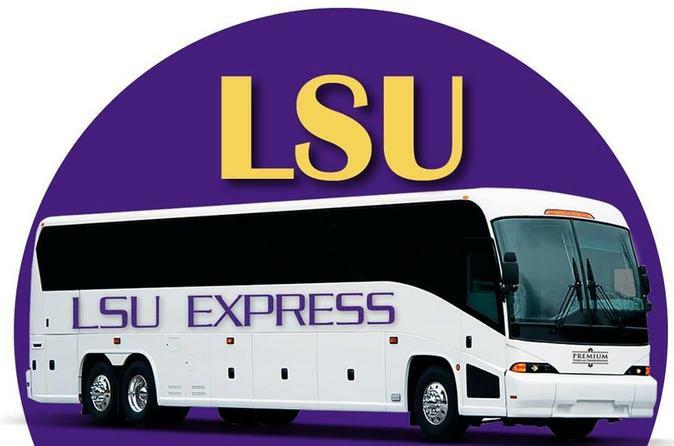 Reserve your seats on a stylish, executive coach for round-trip transportation to Tiger Stadium in Baton Rouge, from downtown New Orleans for the game on Saturday, November 3rd, 2018 between the LSU Tigers and the Alabama Crimson Tide. The executive coaches have bathrooms, WiFi, and business class seating. College football fans and those visiting New Orleans that plan to attend the football game on November 3rd at Tiger Stadium can book seats for round-trip transportation to and from LSU's Tiger Stadium in Baton Rouge to downtown New Orleans. There is time included to tailgate at LSU. Please plan accordingly and bring all necessary supplies (coolers, ice chests, food, drinks, sunscreen, etc.). The exact departure time will become available when the game time is announced. Guests will be notified via text and/or email prior to the event to know what time the bus will leave. The bus will depart approximately four hours prior to kickoff. This purchase includes round-trip transportation and does not include a ticket to the game. Tickets should be purchased separately.